Everyone knows that it�s tough to win many races without a good knowledge of the racing rules. And if you want to learn the racing rules, one of the best things you can do is study the appeals and cases. 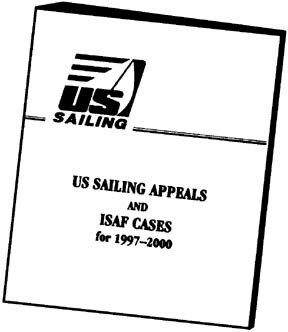 The US Sailing Appeals and ISAF Cases are authoritative interpretations and explanations of the rules. The appeals and cases are not rules themselves and do not have the status of rules. However, they offer strong guidance for protest committees (and therefore for sailors, too!). 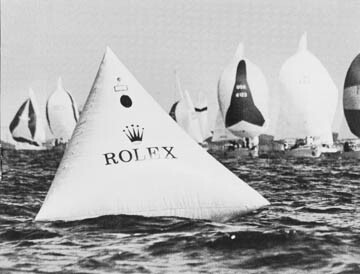 The US Appeals Committee hears many appeals each year from racing sailors around the country. Most of these are not published. However, those appeals that clarify an important meaning of a rule or increase the understanding of a complex rule are included in the appeals book. The Rules Committee if the International Sailing Federation (ISAF) reviews appeals that are decided (and submitted) by its member national authorities. It chooses some of these for publication and inclusion in the ISAF Casebook. These offer authoritative interpretations of the racing rules for sailors all over the world. - Every appeal and case has been rewritten as though it was decided under the new rules. - A number of old appeals and cases have been deleted because they were either incorrect, misleading or covered by one or more of the new rules. - All of the appeals and cases have been renumbered sequentially so no numbers are missing. - Out of more than 160 appeals and cases, only a handful of decisions were changed as a result of the new rules. This is consistent with the intent of the new rules, which was to maintain the way we "play the game." Though most of the appeals decisions are not new, you can learn a lot about the new rules by seeing how they have been applied in each case. Whether of not you studied the case and appeals in the past, now is a great time to get the new, revised book and start learning. Continue reading to find a bunch of notes, tips and highlights from the new cases and appeals. 1. When a starboard protest comes down to the work of one boat versus another, how should it be decided? Case 50: "Rule 10 protests involving no contact are very common, and protest committees tend to handle them in very different ways. Some place an onus on the port-tack boat to prove conclusively that she would have cleared the starboard-tack boat, even when the latter�s evidence is barely worthy of credence. No such onus appears in rule 10. Other protest committees have been reluctant to allow any rule 10 protest in the absence of contact, unless the starboard-tack boat proves conclusively that contact would have occurred had she not changed course. Both approaches are incorrect . . .
"A starboard-tack boat . . . need not hold her course so as to prove, by hitting the part-tack boat, that a collision was inevitable. Moreover, if she does so she will break rule 14. At a protest hearing, S must establish either that contact would have occurred if she had held her course, or that there was enough doubt that P could safely cross ahead to create a reasonable apprehension of contact on S�s part and that it was unlikely that S would have �no need to take avoiding action� (see the definition of Keep Clear). "In her own defence, P must present adequate evidence to establish either that S did not change course or that P would have safely crossed ahead of S and that S had no need to take avoiding action. When, on all the evidence, a protest committee finds that S did not change course or that there was not a genuine and reasonable apprehension of collision on her part, it should dismiss her protest. When, however, it is satisfied that S did change course, that there was reasonable doubt that P could have crossed ahead, and that S was justified in taking avoiding action by bearing away, then P should be disqualified . . ."
2. When a port-tack boat hails "Hold your course," how does this affect a starboard tacker? Appeal 27: "In response to the questions regarding a boat that has been hailed to hold course, it is permissible to hail, but the rules do not recognize such a hail as binding on the other boat. S can tack or bear away at any time she is satisfied that a change of course will be necessary to avoid a collision." 3. When a port-tack boat does not see a starboard tacker, does this relieve her on any of her obligations under rule 10? Appeal 51: "The fact that P was unable to see S until they were on a collision course cannot be used to relieve her of her obligation to the right-of-way boat. The situation is not unlike one where a port-tack boat barely clears a starboard-tack boat only to find another starboard-tack boat to windward of the one she has just cleared. "When she cannot see behind an obstructions, the obligated boat must anticipate what might appear from the other side of an obstruction. A burdened boat, when keeping clear of a group of boats holding right of way, is responsible for anticipating what obligations she is incurring, even though she cannot see all the boats." 4. If a right-of-way boat does not have contact with a give-way boat, can she break rule 16? Case 60: ". . . A was free to adopt any course she chose to reach the leeward mark, but she did not have the right to luff into the path of B so close to B that B could not keep clear. Despite B�s bearing away as hard as possible, a potentially serious collision would have occurred had A not taken avoiding action by quickly luffing further. As it turned out, their combined efforts narrowly averted such a collision, but that does not change the conclusion that in this case when A changed course she did not give B �the space [she needed] while manoeuvring [to keep clear] promptly in a seamanlike way,� and therefore A broke rule 16." In other words, the appeals committee is saying that when a right-of-way boat (R) changes course near a give-way boat (G), R must give G a chance to keep clear by her own actions. 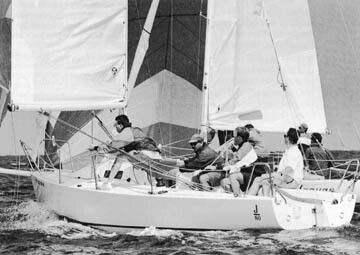 If R changes course and then the only way for the boats to avoid contact is for R to change her course again, R did not give G room to keep clear (as required by rule 16). The definition of keep clear says that G keeps clear of R if R "can sail her course with no need to take avoiding action." If R must change her course to avoid contact, then G did not keep clear. If G did not keep clear, then R�s original course change broke rule 16 (assuming G tried her best to avoid contact. 5. Are there any times when course changes by a right-of-way boat are not limited by rule 16? That�s another good question. 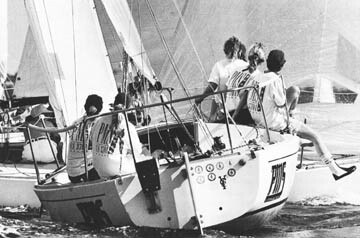 The old rules included several exception to rule 35 (Altering Course), such as when the right-of-way boat was luffing or rounding a mark, However, the idea in the new rules was to get rid of exceptions. Case 86: "From the time the boats jibed onto starboard tack until I jibed onto port to round the mark . . . I was obligated by rule 18.4 to sail no farther from the mark than needed to sail her proper course . . . The only other rule that limited I�s rights under rules 11 and 18.2(a) was rule 16, which required I to give O room to keep clear as she changed course . . ."
6. What exactly does rule 16 mean by �changing course�? "It is a change of course for a boat to sail the arc of a circle or any other course where she is changing directions, whether or not she moves her helm. To change course means to change compass direction." 15. When are boats considered to be �about to pass" a mark? Case 84: "The phrase �about to pass� has never been defined precisely, nor can it be. In approaching a mark, there is no exact point at which a boat becomes �about to pass� it. Almost always, a boat two hull lengths from a mark is about to pass it, but this is sometimes so at a greater distance too. "Not only is the distance from the mark a factor, but the boat�s speed is also important, and other factors such as the condition of wind and current and the amount of sail handling required before or during the rounding may also be relevant. Moreover, the nearer the boat is to the mark the more definitely she is about to pass it. The answer to the question depends upon the particular circumstances of each situation." 16. What does rule 18 mean by the word �room�? The first place we should look, or course, is at the definition of "room" in the back of the rulebook. In addition, US Appeal 20 offers a little more insight about what "constitutes room." Appeal 20: "Room is the space a boat needs to pass the mark in a seamanlike way, not the space she would take to pass the mark in a tactically desirable manner." 17. When a boat without right of way is inside at a mark rounding, how much room can she take? Case 21: ". . . As the definition states, the word �room� in rule 18.2(a) means the space needed by an inside boat without right of way, which in the existing conditions is handled in a seaman like way, to pass promptly between the outside boat and the mark or obstruction. "The term �existing conditions" deserves some consideration. For example, the inside one of two dinghies approaching a mark on a placid lake in light air will need and can be satisfied with relatively little space beyond her own beam. At the other extreme, when two keelboats, on open water with steep seas, are approaching a mark that is being tossed about widely and unpredictably, the inside boat may need a full hull length of room or even more to ensure safety. "The phrase �in a seamanlike way� applies to both boats. First, it addresses the outside boat, saying that she must provide enough room so that the inside boat nee not make extraordinary or abnormal manoeuvres to keep clear of her and the mark. It also addresses the inside boat. She is not entitled to complain of insufficient room if she fails to execute with reasonable efficiency the handling of her helm, sheets and sails during a rounding."